May 31, 2014 February 4, 2017 Hallie B. 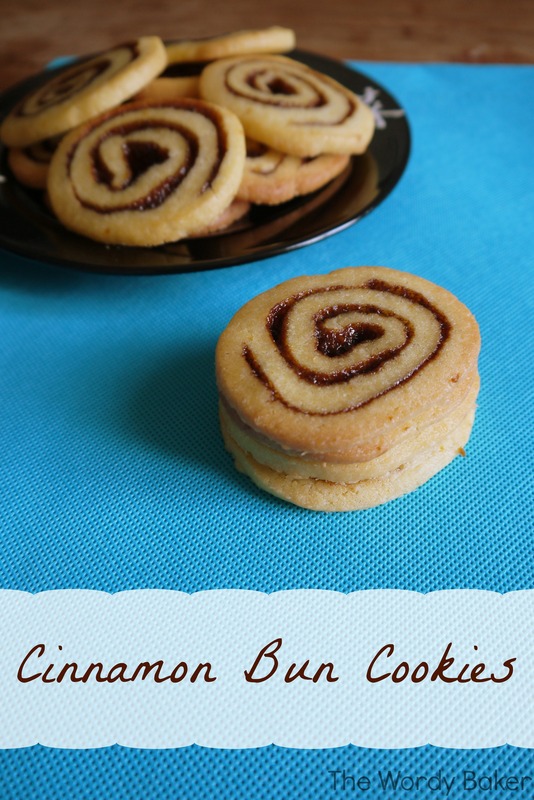 Butter cookies swirled with cinnamon and a hint of orange–your favorite breakfast treat in cookie form! I’m very slowly packing up all my things, sorting what to mail home and what to drag about with me for the next six weeks. What clothes to toss and what to donate. What papers need to be kept and which I can recyclen (yes, that is how you say “recycle” in German, it’s not a typo). I’m doing all the necessary “lasts,” too, or trying to. One “last” I did just over a week ago was go on a picnic with the high schoolers who’ve been involved in the Austro-American Society. Each month, a bunch of TAs and I planned some sort of activity that was “American” or at least involved speaking English. We had pretty decent turn-outs most of the time, but at this most recent event we only had two students show up. Ah well. They’re all in the middle of taking the Matura, the high school leaving exam which holds way more sway than an American high school diploma. Anyway, despite the small turn-out the picnic was a lot of fun. It was one of the gorgeous days we had, with really warm weather, and we just chilled by a lake with lots of snacks, including these Cinnamon Bun Cookies. Cookies in their tupperware, on the way to the picnic. I’ve already shared Cinnamon-Raisin Bagels, Cinnamon-Raisin Bread, and a cinnamon-raisin-walnut filled Reindling with you, now here something for those who like the cinnamon but not the raisins (which I don’t understand, even though most of my extended family belongs to the anti-raisin clan). And we’re branching out in the cookie world, too–these aren’t drop cookies, like I usually make. Actually, the cookie dough log reminds me of store-bought slice’n’bakes, but these are so much better. 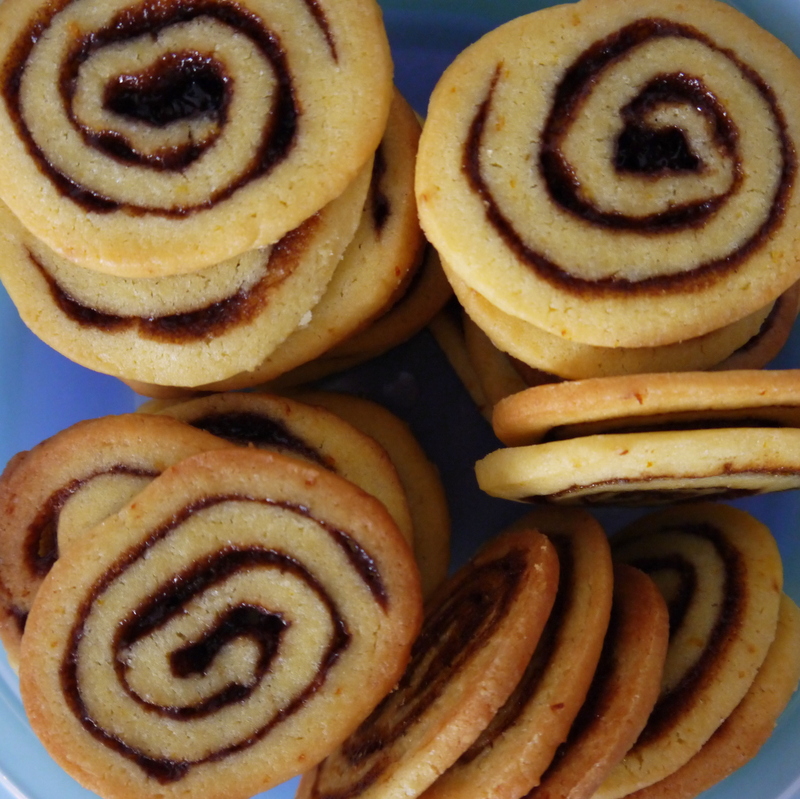 A brightness from the orange zest; butteriness from, well, the butter; and cinnamon’s signature sweet and spicy flavor, all rolled up (literally) into one great little cookie. Enjoy! Very slightly adapted from Wanna Come With? For the cookie dough: Cream together butter, sugars, zest, and vanilla until light and fluffy in a large bowl. Add the egg and beat until fully incorporated. Add flour. I would suggest putting it in the fridge while you make the cinnamon filling, then continuing with the assembly of the cookies. For the filling: Beat butter, brown sugar, molasses, cinnamon, flour, and vanilla in a medium bowl for 2-3 minutes, until lighter in color and fluffy. Set aside. Assembly: Cut a large sheet of parchment paper on an empty workspace. The original suggest 12″, I would say more like 16″. Roll the cookie dough out on the parchment until it is about the same size but no larger. Spread the cinnamon filling on top of the cookie dough. Fold over the long end tightly onto itself, and then continue rolling as tightly as you can. When you’ve rolled it into a cylinder, roll it a few times gently to even out any dents you may have made. Pop in the freezer for about 30 minutes. While in the freezer, preheat the oven to 375ºF. Line cookie sheets (I needed 2) with parchment paper or silpats. Remove cookie dough log from the freezer and slice the cookies, about 1/4″ thick. Place on prepared cookie sheets and bake for 12-14 minutes, until the edges are just golden brown. Let cool on the pan for a few minutes before removing them to cool completely. Posted to What’s Cookin’ Wednesday and Happiness is Homemade! View all posts by Hallie B. These cookies look amazing!! Good luck with all the packing…not my favorite thing. Come join me as I explore food, travel, crafting, and how to be a 20-something.